On weekends, we feature the work of our sponsors, who are often the small companies making good food right. We are honored to make you aware of products you might not know without these posts. For years, I ate salads with whatever dressing was in the plastic bottle from the refrigerator. The Russian dressing was flamboyant red. The ranch tasted like a chemical version of dill. And the Italian dressing would make a person from Italy cry — there were little flecks of imitation peppers or some kind of dreck floating in a viscous bath of glurby dressing we poured on iceberg lettuce. No wonder I didn’t like salads for years. I’ve been making my own dressing and vinaigrette for years now. I can’t look at those bottles anymore. Why pour a dressing with xanthan gum, phosphoric acid, modified food starch, artificial flavors, and disodium guanylate onto a plate of fresh vegetables? It’s pretty easy to make our own. However, when I met Elaine at Fosse Farms, I was immediately impressed with her bottled dressings. They are made with real ingredients: extra-virgin olive oil (instead of canola or soybean oil), locally sourced fruits and herbs, and strong flavors like blackberry-garlic, cranberry, and the herby Provencal. Every ingredient is organic, including the small amount of sugar added to the dressings. (Elaine is considering a bottling change soon, which will allow her to use honey instead.) And, these dressings are certified gluten-free as well as non-gmo. They’re also soy-free, dairy-free, vegan, and kosher. Goodness! We have loved using these dressings on the nights we need dinner on the table now, like after Lucy’s swim team practice or dance class. The blackberry-garlic (wonderfully strong on the garlic) is great on seared salmon. The cranberry dressing drizzled on roasted chicken is a lovely surprise. And Danny is particularly fond of the Provencal dressing, with lots of herbs and white vinegar. We’ve been using that one often this January. We think you’ll like the Fosse Farms gluten-free dressings as much as we do. And we’ll let Elaine tell you more about her work here. Can you tell us how your work began? Fosse Farms‘ line of salad dressings, dips, and marinades is an extension of the warmth that permeated my mother’s kitchen – warmth not just from the heat of the oven but from the atmosphere my mother fostered while preparing delightful, delicious meals. Her simple but elegant creations were an expression of love for her family; she welcomed any guest or friend coming into her home by making them truly feel “at home.” The kitchen was the gathering place for all of our social interaction. The comfort and warmth that emanated from my mother inspired me to create products that have their roots in a simpler time when wholesome food was created with tender care and locally sourced ingredients. My mother created a variety of dishes that had distinct flavors which were unforgettable. I started making my own salad dressing more than twenty years ago because I became tired of consuming insipid dressings that were full of undecipherable ingredients that appeared to be unhealthy. I harkened back to my days as a youth when I had the good fortune to eat fresh, wholesome food. Why did you work to make your dressings gluten-free? gluten free folks in Auburn and obtained my certification. Also, my product has been verified non-gmo. It was my goal from the beginning to make a clean, green product. My product is certified organic and all the organic berries and herbs I infuse my vinegar with are purchased from Washington or Oregon. What would you like our readers to know about your products? The creativity and purity of my mother’s culinary style is the foundation for all Fosse Farms’ offerings. Our company produces products with the intent of fostering a sense of joy and wellbeing. 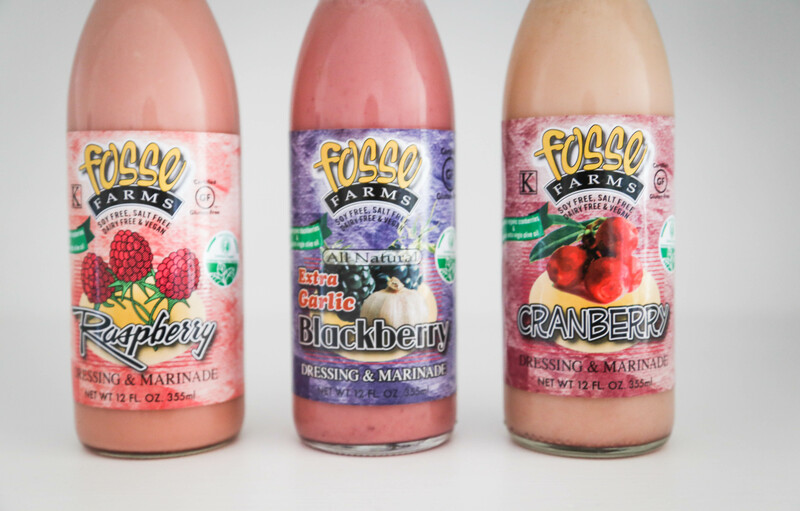 Fosse Farms is carrying on the tradition of my mother by seeking to enhance the “family” experience with products that are made in small batches with organic ingredients (berries, herbs, garlic, olive oil and hand-infused vinegar). Fosse Farms is committed to using no fillers, chemicals, salt, soy, or dairy products. All products are gluten free, vegan, kosher, and low in calories. We make every effort to create an ecologically sound product where nothing is wasted in the production process. The goal of Fosse Farms is to be part of the sustainable farming movement that provides a healthier alternative to highly processed, mass-marketed agricultural products. Elaine is offering bottles of Fosse Farms’ dressing to three lucky readers of Gluten-Free Girl and the Chef. Please leave a comment about why you might like them if you would like to be eligible for the giveaway. Winners will be chosen at random on Friday, January 24th. I would like to taste the dressings to believe again that salad dressing can be good. I recently made the first dressing that my daughter likes (olive oli, lime, honey). Took me eight years to encounter something that she likes. Surely there must be good dressings out there! I myself do tend to eat my lettuce plain..
Not so much for me, but my mother in law is the one I want to give a few bottles of this to. She is not only gluten free, but cannot tolerate salt . This year for her birthday we got her salt free spices so she could expand her palette and these salad dressings/marinades would be a wonderful addition to her growing taste buds. And what better way to thank her for the 18 plus years she spent cooking for the one I love than to share a love of cooking with her. We are planning a trip to Seattle and perhaps even Vashon next fall. Will put Fosse Farms salad dressings on our list to pick up. Also, Shauna, we have become very big fans of the Jovial tomatoes, olive oil and egg noodles etc. Thanks for finding these great products! I’d love to discover some bottled dressings that are delicious and healthy. I don’t mind making simple dressings, and it doesn’t take That long, but it would be lovely to have some dressings to play with. Love the idea of a bottled dressing that works on fish or meat (or vegis?) to cook with. Good luck with them! …..because they look beyond absolutely delectable. I want to make a salad NOW. Such a wonderful gift for the allergic person. I travel for work (flight attendant) and always need ready-made go-to dressings for the salads I take with me on my flights. If a dressing can double as a marinade it means I can have room for more condiments in my fridge! These sound so yummy, and I love that they are made with locally sourced ingredients so the flavor will really “burst”. You made me LOL when I read about the chemicals we’re pouring on our lovely fresh, organic veggies. Honestly, I’m always in such a hurry I hadn’t given it a tho’t. I will, moving forward. I’m currently working on getting my family to eat more salads. Right now, the only way I can get it past my son with a ranch dressing that, while a step above Kraft, (less preservatives, less artificial, but not none,) is still rather awful. I’d love to have him try something like the blackberry dressing, which looks to be right up his alley. When we were in Portland several months ago, we stopped into a little Whole Foods market and a lovely man from Fosse farms was there giving samples. We bought the Provençal and have been loving it! (I don’t usually even like salad dressing). We are almost out and would love to win some! Been SO looking for a dressing like this that I could use in emergencies. I just cringe at most commercial dressings! I NEVER eat bottled dressings. They’re usually super salty, full of gluten, and just plain gross. (Though I do remember fondly being a teenager and thinking that iceberg lettuce, piled high w shredded cheddar, croutons, and bottled French dressing was nectar of the gods. The things we do as kids. Sigh.) I’m a skeptic about bottled dressing but would love to be proved wrong! A green salad is a part of our dinner menu every night – I make my own dressing and would love to try something new. I would love to try these dressings, especially the raspberry one. My daughter was recently diagnosed with Celiac Disease and I think she would like this type of dressing. She is 7 and I’m trying to get her to eat salads so we aren’t limited where we got out to dinner. By the way, I’ve found a salad to be some of the most contaminated things going out to eat as a celiac! Just a note from a fellow celiac sufferer–salads are not always your friend when eating out, not only are the dressings often gluten-containing, but the prep area, croutons, and almost always the mixing bowls that previously had croutons make salads a nightmare. I’m a very reactive celiac, so I can tell much better on cross contamination than some others…just wouldn’t want you to think a salad is safe anywhere. You are bound to be limited on where you can eat by your daughter’s illness, but with time and research you’ll find enough places–small mom and pop or chains that accommodate you so you have a decent selection! I make my own dressing but would love to try these. It would be amazing to be able to have salad dressings that are ready to eat, that I’m willing to eat! I love the idea of a marinade or salad dressing that doesn’t have weird chemicals in it and that I don’t have to make myself. I’d love to give these a try. I would like to try these dressings. I am looking for other options for dressing that are healthy for me and my daughter. I would also like to know where to buy them. Sorry to hear it. But you needn’t comment if you didn’t want to be entered in the giveaway! Nicole, if you go to the Fosse Farms website (link in the post), there is a shopping directory. Also, you can order them directly off the website. I would! I’m stuck in a ranch rut and would also LOVE to try a dressing that does not have xanthan gum in it! I was looking for an all-natural italian dressing the other day and couldn’t believe it that all, not just a couple, ALL of them had xanthan gum!…in an oil/vinegar dressing…why? That just doesn’t make sense to me! I would love to give them a try! I know making homemade dressing is easy but it is way more work than just pulling a bottle out of the fridge, so I would love to win these! I too can’t have gums, so being able to have a salad dressing that I can actually eat would be such a treat! My default dressing is just a drizzle of organic olive oil. It would be lovely to try really great tasting dressing that is safe and healthy! These look fabulous! As someone who is newly diagnosed with celiac I can’t tell you what a godsend your blog is. I would love to try these! My husband makes his own dressings but these sound wonderful and not boring oil and vinegar like his! If they start putting honey in the dressings, they’re going to have to give up their vegan label. I’m a little surprised they’d want to do that considering what a huge market it is. Sugar, be it white, honey, corn or whatever is processed by the body the same way. Eager to enter this draw as I would love to try these bottled dressings! I would feel good having this in my refrigerator for my teenage daughters to add to their frequent salad snacking! Thanks! Oh that Provençal looks and sounds tempting! I love the taste of fresh, made from scratch dressing. I am looking forward to trying these-I hope I win 🙂 Thanks for the giveaway!! These look so pretty and sound like some pretty fabulous flavor combinations. It would be great to try something new to get out of our current rut. Thanks for the giveaway. The extra garlic blackberry sounds like such a fun thing to experiment with!! I’ve been looking for new flavors to add to my salads and cooking. These sound fabulous! I love handmade dressings. However, I work long hours and cannot always make this happen during the week. My daughter is gluten, dairy and soy free. What a help these would be! Thank you for offering such a treasure! Ooh these sound yummy!! We eat alot of meat and salad would love some dressing/marinade options that are bottled and healthy 🙂 DH is always looking for a bottle of something to bring for lunch leftovers!! These look delicious! My children are very into Ranch and Italian dressings. When I first started to make my own, they were over the moon (I’ve never loved ranch so much!). But kids are fickle, and now they often ask for the store-bought. I’d love to introduce them to new flavors from a bottle. These salad dressings look wonderful and sound very versatile which impresses me! I’m always trying to figure out how to get more flavor from what my refrigerator holds! Dressings without soybean oil?!? Hooray!!! I often have to make my own dressings because soy doesn’t agree with me, which can be so time consuming. It would be great to have a bottled dressing that I can use! Not to mention that they’re local and I love supporting locally produced goods. I would love to try these! My picky picky picky son has autism & digs all things raspberry, and the Raspberry Roasted Chicken sounds divine. I just found out that I’m gluten intolerant. Would love a yummy dressing to use on my salads at work! I would love to give these a try .. I’m trying to eat more salads this year . This post made me want a salad NOW (9 am). My son will only eat salad is there are lots of croutons on it. I wonder if these dressings would be flavorful enough to change that? Would love to try a dressing without xanthan gum or dairy (of course, GF), and the berries sound like a huge bonus! I would love to try them, because the flavors sound amazing! I would love to try a delicious dressing in a bottle! And they’re organic, local, and non-GMO: wow! I love salads & hate bottled dressings (until now hopefully as these are home made just stored in a bottle:). My 2 yr old son would love these flavors too! I have a hectic schedule doing my medical training, and am always looking for ways to make quick, healthy and new gluten free meals. These dressings would be a great, celiac friendly way to quickly season up dinner. I was just diagnosed as being gluten intolerant. IHave been trying a lot of new products and found that they are not that appetizing. It would be nice to be able to taste some products that people highly recommend as being appetizing without spending a lot of money and then realizing they taste awful. I’d love to try it out as I’m trying to find alternative dressings to what’s at the grocery store.